Getting paid to make a search on the internet is a big earner. This is how to search paid links so that you make money and the advertiser makes cash as well.  The advertisers of the paid searches must get paid for them to advertise again.  A proper paid search will take longer than the time given before you get credited.  Search for a different subject each session. Prepare your browser so you can see the progress of the search. Click 1 - to the link page. Click 2 - to the choice of search subject. Click 4 - to select the link to a site the search produced. People who wish to promote their web site can pay to be listed on the first page of a search engine. The top bid made for a search word gets #1 position on the page. Without payment, most sites would be on page 10+ with millions of other sites. Who looks at page 9 of a search result? No one! 1. 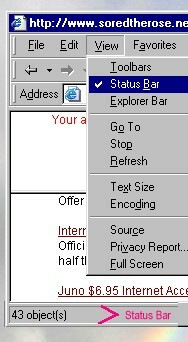 You must be able to see the Status Bar at the bottom of Internet Explorer. Otherwise, you will not be able to see when a web site has finished loading. In general, if a site has not finished loading, the advertiser will not be paid. In the top menu, go to View and make sure Status Bar is ticked. Looks like this..
2. Make sure new windows will load smaller than your screen. This will allow you to see more windows at the same time. Click the middle of the top right buttons (two squares) to restore the smaller window size. If it is still the same size as your screen drag it down a bit. To do this, place the arrow (cursor) in the blue area at the top of the window, left click and hold the button down then move the mouse down and right. Place the cursor on the top left corner till the cursor changes from an arrow to a diagonal arrowed line, left click and hold and drag the corner down and right. Finally, with the cursor in the top blue section, drag the re-sized window to the required position. Close the window and open it again, and this time Windows will have remembered the size and position you chose. After loading your PTS (Paid to Search) program, click on the first link ( start with the bottom, oldest link in case it runs out of paid clicks while you are working ). A new window will open with a copy of the email that was sent to you. Re-size and drag this new window to the right of the screen. You will only need to see the links, usually in underlined blue text. Click 2 - to the choice of search subject page. Click on the first blue link. Some emails will have only one, some up to four or more. If the email has only one link or all the links have been clicked, go back to the PTS program and click on the next link and tick the select box to remind you where you have got to. Click 3 - to select the search word or phrase. In the top frame, on the left, will be a sentence saying something like 'Wait 20 seconds for the window to load' and the lower frame has a list of search words. Click on a word or phrase that interests you or type in a new word if you do not see it. My favourite subjects are gambling, weight loss/slimming, drugs and working from home and these are often some of the highest bid words or phrases. Make sure you click on a different word or phrase each session. The same words can be searched the next day. A new search engine results page will open (a) in the same window, or (b) in a new window on top of the old window. By this time the top left message will have changed to something like ' Thank you. Your account has been credited' Ok, you have been paid early, but please complete the search so that the person who put up the PTS link gets paid, otherwise you may be marked as one who quits early and so get fewer search links. If (a), you will have to wait for the search results to load. The search results page will list Result 1, 2, 3 and so on. Click on the top sentence of 1 and check if the loading box has widened and started to fill with blue. If it stays small then the link is not working for some reason so click on the top sentence of 2 and so on till one link works and starts loading. If (a) the new page is opening in the same window, you will have to wait for the loading to complete and 'Done' displays in the Status Bar at the bottom left of the window. If (b) the new page is opening in a new window, you can immediately start on the next email PTS link and come back to this page later once it has loaded. A nice touch, that is optional, is to visit another page on the site that loaded as a result of your search. Hopefully you will want to anyway but it does show up on the site's stats that searches from this engine is made by people who really look at their site and not just the front page. This is more practical if the result is (b) and the site opens in a new window.